Sarah Nader- snader@shawmedia.com Karen Sutera, director of the Harvard Diggins Library, helps set up an exhibit focused on President Abraham Lincoln, the Constitution and the Civil Way at the Harvard library Wednesday, July 24, 2014. The traveling exhibit will open July 26 and run through Sept. 5. The library will also host "Abraham Lincoln in Song" event July 26 and August 13. 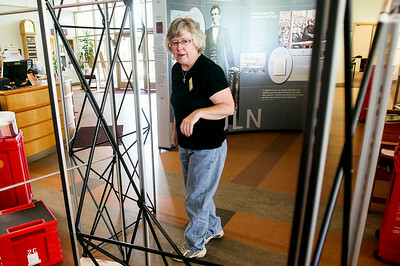 Karen Sutera, director of the Harvard Diggins Library, helps set up an exhibit focused on President Abraham Lincoln, the Constitution and the Civil Way at the Harvard library Wednesday, July 24, 2014. The traveling exhibit will open July 26 and run through Sept. 5. The library will also host "Abraham Lincoln in Song" event July 26 and August 13.